Phones with bendable screens are coming whether you like it or not. Samsung showed off a prototype of its upcoming flexible phone at its developer conference in November, and Royole revealed the FlexPai before that. LG and Huawei are also rumoured to be working on their own folding phones. But among all the leaks and rumours, a mysterious video of an unreleased bendy screen device might be the most exciting example of flexible display tech yet. In a video uploaded to Twitter by @evleaks, the unnamed device is “allegedly made by” Chinese phone giant Xiaomi, and from the clip looks to be quite legit. Rumours have been swirling that Google has teamed up with an “unusual” partner for a yet-unreleased device, and with what looks like a Chinese version of Google Maps running on the screen, it’s possible this is it. But what’s even more important than the simple existence of another flexible screen device is the way this particular gadget actually bends. Instead of featuring two halves that can be opened up to create a larger display like Samsung’s prototype (or even the dual-screen Axon M), this mysterious video shows off a tri-fold design with a central display area in the middle, and flaps on either side that can folded behind as needed. Ignore the break in the middle for a second and check out the problem with simply doubling a regular widescreen display like ZTE did on the Axon M.
The use of two folds instead of one offers a significant advantage because normally, when you double a regular 16:9 or 18:9 aspect ratio display, you end up with something squarish. This often leaves you with a lot of wasted space when watching movies and an awkward layout when doing everything else as phones are still based largely around displays with widescreen dimensions. While this mysterious device doesn’t look like it has an exact 16:9 screen ratio when fully unfolded, it seems a lot less unwieldy than any folding screen device we’ve seen yet. On top of that, the action of folding the phone looks quite smooth and doesn’t feature any flickering or lag often seen on less advanced hardware. Seriously, this thing looks damn good. That said, there are a few concerns that this and other folding phones will need to address. The first is one of battery life, because with that much additional screen real estate, even the 4,000 to 4,200 mAh batteries found in phones like the Galaxy Note 9 and Huawei Mate 20 Pro might not be enough to supply a full day of use. As for this particular device, there are also little things like the tiny bumps at each fold that can been seen even when the gadget’s display is fully open. This seems like a result of the phone’s bendable screen not lying completely flat when opened up, which could be more noticeable and therefore annoying when viewed in better lighting. 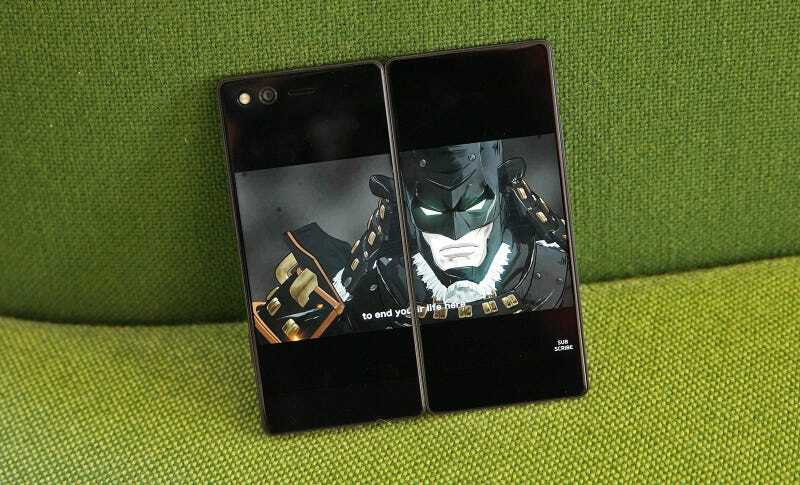 Also, while a few extra millimetres here are there aren’t usually a big deal, with a screen that folds on either side and presumably some guts and a battery behind the middle section, this unnamed phone could end up being seriously thick. But right now, none of that really matters. This thing looks sweet and I just want to know more about it and – assuming it’s real – when it’s going to be available. For folding phone sceptics, maybe this device will be the one that starts changing peoples’ minds.